Note:the shoes size run 0.5 size small if the foot is wide.Classic Patent leather and suede leather uppers,Fully lined and insole with 100% leather, easy to keep feet dry provide all day comfort. Slip-on construction, easy to wear in. 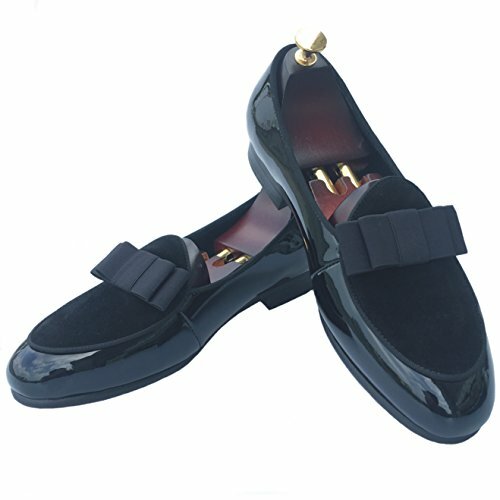 Impressive and Fashion, make you unique and be a focus in any occasion.amazing dress shoes for wedding, party,prom,even etc. Patent leather and suede leather uppers with bowtie,Slip-on construction,easy to wear in. Impressive and Fashion, make you unique and be a focus in any occasion. Fully lined and insole with 100% leather, easy to keep feet dry provide all day comfort. Loafer width suit most people,the shoes size run 0.5 size small if the foot is wide. If you have any questions about this product by Justyourstyle, contact us by completing and submitting the form below. If you are looking for a specif part number, please include it with your message.